I once ate a jar full of very hot-chillies in one sitting, and then washed them down with a whole bottle of vodka mixed with turpentine. I like to call this combination 'The Spirit of Vengeance'. Unlike this film Directed by Mark Neveldine and Brian Taylor; plus Starring: Nicolas Cage, Johnny Whitworth, Ciarán Hinds, with Violante Placido. It was made in 2011 and lasts for 95-minutes. Do you know what? Johnny Blaze (Nicolas Cage) should know better than to make deals with other people. Especially since the last deal he made involved him being turned into the hit-man from hell, Ghost Rider, by the devil named Roarke (Ciarán Hinds). Nonetheless, like the possessed buffoon that he is, Johnny agrees to a proposition posed to him by the drunken monk, Moreau (Idris Elba), to save the devils son, Danny (Fergus Riordan), from an arms-dealer called Ray (Johnny Whitworth), who was hired by Roarke to capture his own flesh and blood in the first place. Moreover, to give Johnny some extra added incentive, Moreau promise's him that his 'holy tribe' will expunge the devil from his inner soul if he is successful with this mission. Wow! I am sure that this sound's like a straight forward deal; doesn't it? However, I am afraid to say that there is nothing straight about forward about how this adventure then plays out. Quite ying-yang in fact. You see, on a bad side of things, when 'The Rider' first tracks down Danny, rather than saving him from Ray, instead Danny is snatched from his mother arms, Nadya's (Violante Placido), by Ray, and then manage to get away Scott Free. Whereas, on the good side of things, the second time there paths cross, 'The Rider' is able to redeem himself by returning Danny back to his Mother and kill Ray not so long after. Phew! Adventure over, right? Wrong. Alas, as soon as Roarke witnesses the aftermath of this ordeal, he brings Ray back to life as 'the lord of decay', just in time for what next to transpire to be one hell of a shindig. As Johnny is reborn - Danny is torn - families start to jell - and the devil goes to hell. Now to be perfectly honest with you, I did not really mind watching the first 'Ghost Rider' film (click here for review) at all. I personally felt that it was a fairly decent comic book adaptation, whose only pitfall was the lack of a decent villain and a mumbled story-line. Though, where 'Ghost Rider - Spirit of Vengeance' is concerned, I felt that it was just like being sick. Yes. Correct. I did just compare this film to 'expunging your innards'. Please note though, this 'endeavor' does have both positive and negative connotations behind it. On the one hand, you can feel quite euphoric after spewing your guts up into the toilette basin. Whereas, on the other hand, it does leave a rather bitter taste afterwards. Here, please allow me to reiterate on my implication in an advantage / disadvantage fashion. ADVANTAGE: (1) I genuinely liked most of the scenes between Nicolas and Idris, because these two fine actors added some much needed character and pathos into the proceedings, without it feeling like exposition. Also, for what he had to play with, I felt that Johnny Whitworth didn't do a bad job of 'hired goon with a twist' either. (2) The majority of the special effects in this flick were just great. I particularly liked the way 'The Rider' transformed whatever vehicle he was riding into some sort of flaming chariot, and I was looking forward to him going ice-skating sometime during this adventure, ha! (3) The intermediate animation segments were really nice to follow, lavishing this film with some artistic and cleverly constructed panache and charm. DISADVANTAGE: (1) The last film worked best by juxtaposing both the dark side and the light side in Johnny's character in tandem. But I am sad to say that this film has done away with this component completely, and was heightened more so because most of the supporting cast seemed very intense for the sheer hell of it. (2) On occasion I felt that the camera-man must have been pissed out of his head. Well, the screen seemed to shudder and tilt here and there for no apparent reason what so ever. (3) The 'black-out' fighting scenes did not really work within the style of this movie. If anything, it took me out of the picture due to the abrupt nature of this 'effect'. (4) The concept behind this film was a good one to explore - the path of the devil and his son. However, this film explored this aspect in a very-fractured way, making this segment of the 'bigger picture' come across as a 'sub-plot' at best. OK, I know that I could go on and on about 'Ghost Rider - Spirit of Vengeance', and explain how it needed some extra jazz to make it into a 'better film'. But I don't want to do that, do I? I want to give you some film-facts: (1) Unfortunately the pretty-pretty actress, Eva Mendes, turned down the offer to reprise her role on this film. Whereas Peter Fonda would have liked to have returned as Mephistopheles. (2) Johnny Whitworth was born on Halloween in 1995. (3) Johnny Blaze's motorcycle in this project is the Yamaha VMax. Also, 'The Riders' skull was redesigned for this movie. Implying that it is actually on fire. (4) Nicolas Cage's father, August, is a literature professor, and the brother of famed 'Godfather' director, Frances Ford Coppola. Nick changed his surname early on in his career, so that this association did not hinder his filmic future. (5) This movie has a website. www.thespiritofvengeance.com. (6) Ciarán Hinds is Irish, and is good friends with Liam Neeson too. (7) Director, Tim Burton, cast Nick in his doomed Superman project. (8) This adventure did not have a critics pre-screening. (9) Critical reception has been negative for this comic book sequel. Rotten Tomatoes gave it a 18% rating based on 97 reviews. Did you read points 9 and 10 of my trivia splurge? Tut-Tut-Tut! The makers of this movie knew that there was something wrong with this film before its initial release, and this summation has been backed-up by my fellow filmic-elite too! Shame really. 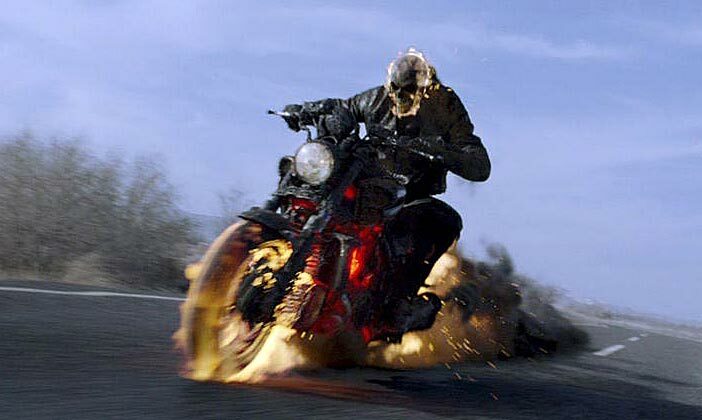 I have always liked 'Ghost Rider' as a character. And I was hoping that those with the 'cash to splash' would have liked him enough to do him some justice. Well, come on, the origin and the concept behind 'flame head' is good one to explore. Nicolas Cage is a great actor. The special effects were up to par. All they needed was a decent script to propel this franchise into infamy and beyond! Agreed Nick? Hmmm? No comment. I feel ill, Bluurrrg!